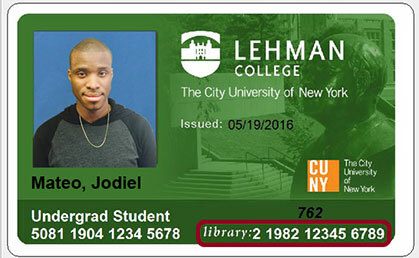 When off campus, Lehman users will need to log into databases, e-journals, e-books, and other subscription resources by using their Library Barcode. Your Library Barcode is located on the front of your ID Card (see above). Enter the number without spaces or dashes. Your barcode must be activated in the CUNY library system. To activate your barcode, visit the Circulation Desk on the first floor. Your account must not have any outstanding fines.